The RockBrawler spare tire carrier is built from the highest quality components. 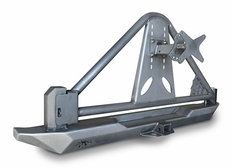 The main structure of the tire carrier is fabricated from NC-bent DOM tubing and laser-cut, precision brake-formed plate steel. The extreme duty hinge assembly includes a CNC machined spindle and housing, with a pair of Timken tapered roller bearings for smooth operation under the heaviest loads. The latch is a high quality automotive grade mechanism, concealed in a fabricated housing. 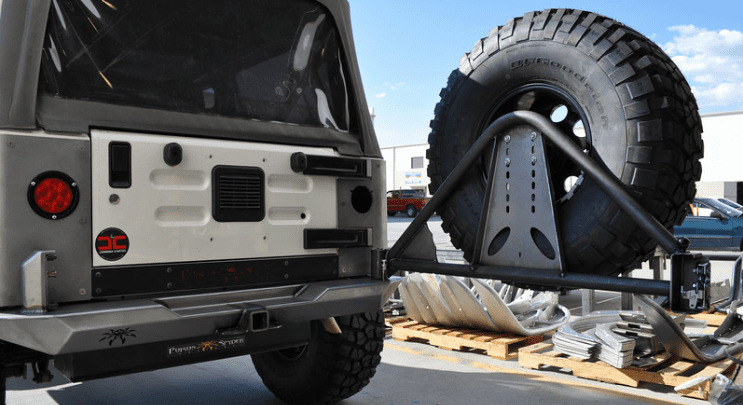 There is a spring-loaded pin-lock with stainless steel slider plate that locks the tire carrier into the open position to keep it from swinging around while accessing the Jeep's tailgate. The latch and pin lock are both easily disengaged with a simple pull of a knob. The tire mount is adjustable up and down, as well as in and out, to accommodate a wide variety of tire sizes up to 40". The adjustability allows the tire to be mounted as low as possible for any tire size, to keep a low center of gravity. The included license plate mount places the license plate at the center of the spare tire. The part number for this item is Poison Spyder 14-61-020 and it fits 1997-2006 Jeep Wrangler models.